Address: 137, Station Road, Agra Cantt, Agra, Uttar Pradesh, 282 001. Access: 4 kms. from Airport, 1 km. from Railway Station, 2 kms. from Bus Stand. Facilities: Double A/C 36, Double NON A/C 30, Double Total 66, Suites A/C 5, Suites Total 5, Total A/C Rooms 41, Total NON A/C Rooms 30, Total Rooms 71, Centrally Airconditioned, 4, 350, 100, 1, 1, Room Service, H/C running water, Telephone, Fax, T.V., Safe Deposit, Banquet Facilities, Conference Facilities, Beauty Parlour, Shopping Arcade. Services: Doctor on call, Laundry, Money Changer, Banking, Safe Deposit. Grand Hotel Agra is a government-approved hotel and is about four kilometres from the airport and just one kilometre from Agra Cantt railway station. 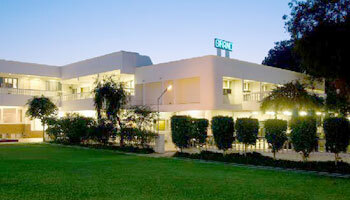 The hotel is well equipped with the modern facilities and offer warm hospitality. Grand Hotel Agra has 71 well appointed rooms that are fully equipped with all the facilities. The in-room facilities at the Grand Hotel Agra include color TV, safe and room service. The other facilities provided by Grand Hotel Agra include parking, travel desk, laundry and dry cleaning, music shows and doctor on call. The hotel Grand Agra provides all the modern facilities to its guests and make their stay in the hotel a comfortable and memorable affair. To tickle your taste buds the hotel Grand Agra offers Indian and Continental cuisine. What do you think about Grand Hotel Agra? Stayed here Dec. 1, 2007 and was happy with the experience. The room was large & clean; actually was the best HOT shower we had in 3 weeks travel throughout India. Breakfast buffet was so/so. Didn't eat at the restaurant. During wedding season the noise can be a problem, but we found that was an issue almost everywhere we went. We asked to be placed away from the event and the staff was accommodating. Would stay here again. The Grand is located among a military settlement, a fair distance from any traveler amenities (restaurants, food/sundry shops), and shares the run-down, semi-abandoned look of its surroundings. The room was clean and bug-free, but drab. Linoleum floor; low, thin-mattress bed, bare walls, TV sitting on a formica table. The bathroom was a tile floor, and the shower was the same floor, sunk about four inches. The room's door was a single key lock, no deadbolt or chain, and the plastic chair did not reach high enough to wedge under the door handle. Not as safe as some travelers might prefer. I contacted this hotel directly from US and told them the dates I needed the room for. They sounded quite informal in reserving room for me. No name or credit card was asked for. Later I realized that August is a lean period and very few guests were seen during our visit. May be that's why they didn't feel the necessity to ask for name etc. The hotel is very close to the Agra cantonment railway station (both seen in google map -satellite). The hotel has a nice garden and the rooms are quite spacious and clean. I was there with my family of four and all of us felt comfortable. The bathroom was very clean too. We did have running hot water for bath. The food was very good. Service was courteous. I was in this hotel in the month of march with my family and loved every thing that they had to offer. Service is good, Food is for sure the best you can get in Agra or I should say one of the best I've ever had, Rooms are all newly done and good and very spacious and same with Bathrooms. My kids loved it and had a gala time running around in thr big lawns. All the rooms are lawn facing and well maintained. Staff is very very helpful. I can actually go on praising about this experience on and on but is running short of time. In short every thing in thr was absolute pleasure and if i go to Agra I know where to stay.